Drag the white bar at the top of the screens to the one you want to be the main screen. These instructions are the same for either connecting an external monitor/display screen to your computer or connecting a your computer to an LCD projector. The computer essentially “sees” the projector as an external monitor. Dual Display or Presentation Mode is where the two screens show two different things. The most common use in regards to an LCD projector is when you want to view your “Presenter Notes” in either Keynote or Powerpoint on your laptop display and want the actual presentation – the slides or video – to be projected up on the screen for the audience. If a picture similar to the one above does not show up, your computer may not be “seeing” the projector or external monitor. Click on “Detect Displays”. If the second display does not show up there is some problem with the cable connection. Recheck the cable for connectivity at each connection and try again. If that fails, rebooting will sometimes be necessary for the computer to pick up the projector. 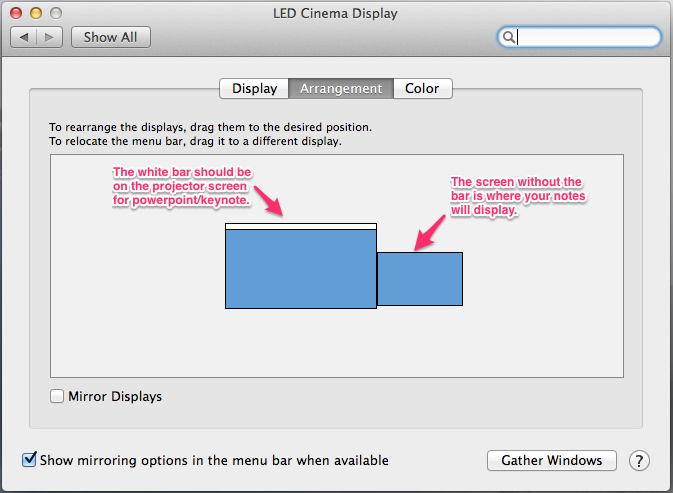 – When sitting at a desk with multiple screens, the screen with the white bar will be your primary screen. – When using a projector, the screen with the white bar will show your presentation while the second screen will show your presenter notes. Or if you want to show the same image on both screens, select “Mirror Displays” and the white bar will disappear. Mirroring, is what the MacBook will often default to. It will show the same identical information on both your computer and on the projector screen.